Don’t you think X-ray Security Inspection System is very useful? Last weekend my friends and I went out to visit a museum. We take subway and had to put our handbags to the Safety Monitoring machine. There are many people and we have to line up .It is very annoying. My friends said. But I think it's all right when we consider about our safety .Do you think so? There are many terrorist attacks and violence happened every day. It's never too careful for our security. And there are four main ways for security check. The first is X-ray security equipment. It is mainly used to check passengers’ bags. If there are some guns or drugs or other dangerous contraband goods and they will be found. The second is to check the detection gate for physical examination of passengers. It mainly to check whether passengers carry prohibited things. The third way is to use magnetic detectors also called hand-held detectors. It is mainly used for close examination passengers. And the fourth is to check the passengers' luggage by hand Staff .That’s very primitive and inconvenient. 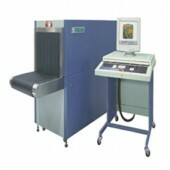 And here is a kind of x-ray security equipment called FISCAN CMEX-B6140 Multi-energy X-ray Security Inspection System. It was designed with the most advanced X-ray imaging technology. And the computer-controlled system make it is easy to use and you can recognize the objects which can’t be recognize by our eye. And it is widely used in many places such as airports, railway stations, local customs, a conference center and post offices and so on. It’s also popular at schools. And it can be used as hand luggage security inspection system. But it is a little obesity bulky and the Weight is about 500Kg .So it is not very easy to moved. And DETECTORALL is a professional Chinese wholesale detectors supplier. It provides various types of cheap metal detectors including this FISCAN CMEX-B6140 Multi-energy X-ray Security Inspection System. And there are many kinds of metal detectors for sale here and it won’t let you down. So if you want to know more details about this kind of detectors please visit http://www.detectorall.com/.